Why Go for Digital Printing? Personalization. Our digital press connects to a database to produce personalized marketing that is more engaging and relevant. Economy. Just order what you need. Gone are the days when companies need to order more than what they need because it was the only cost effective way to get high-quality printing. Quality. The HP Indigo print quality rivals, if not surpasses, traditional offset printing. Speed. It is only through digital printing that a 1,000 pc collateral may be produced within one business day! Wide Range of Materials. The possibilities are endless. You are no longer limited to just paper or card stock. See list of materials below. 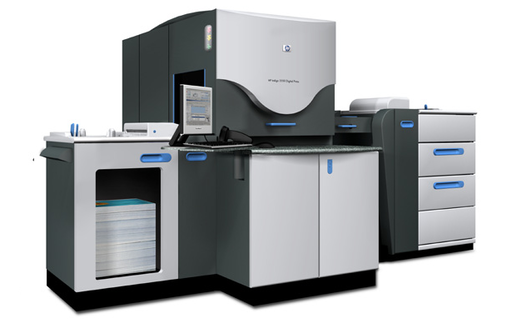 ​The HP Indigo press, based on its Digital Offset Color technology and process, offers a unique combination of high quality imaging, speed, wide color gamut, the ability to print on a wide range of materials and to change every printed copy. HP Indigo presses are used for general commercial printing, direct mail, photo, publications, labels, flexible packaging, folding cartons and specialty printing. Its ability to print without films and plates enables it to create personalized short runs, changing text, images and jobs without having to stop the press. The Indigo prints on a wide variety of materials with additional materials being added frequently. Most stock that runs on the Indigo has been specially designed for digital printing. Chroma carries a variety of materials with the ability to special order more upon request. We have three HP Indigo presses that allow us to run multiple digital printing projects at the same time. Konica Minolta's bizhub digital printing press is a fast, powerful digital printer that can handle high-volume production demands. It has a high-resolution B&W output. Because of its feature of real-time image density and toner ratio sensors, it is able to maintain image stability over long press runs allowing us to print high volume book printing with superior quality. A real workhorse, this is where all our B&W large volume books, NCR forms and lasering on pre-printed forms are printed.